Pre-historic Times. London: Williams and Norgate, 1865. 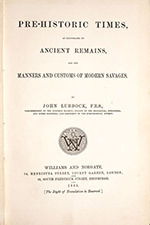 John Lubbock was a member of the new generation who came of age around 1859, when the idea of human antiquity was first given serious consideration, and who accepted the idea immediately and enthusiastically. Lubbock was an archaeologist rather than a geologist, and he had cut his professional teeth on the polished stone axes, or “Celts,” that had been found in England and Denmark. Soon he realized that polished stone tools were only the last stage in a much longer evolution of tool-making. 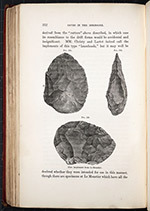 In this book of 1865, he coined the term “Neolithic” for the newer polished tools, and the name “Archaeolithic” for the earlier flaked flints that had been found in Brixham, Abbeville, and Amiens. In later editions, he replaced the term “Archaeolithic” with “Palaeolithic,” which is the term we still use today. 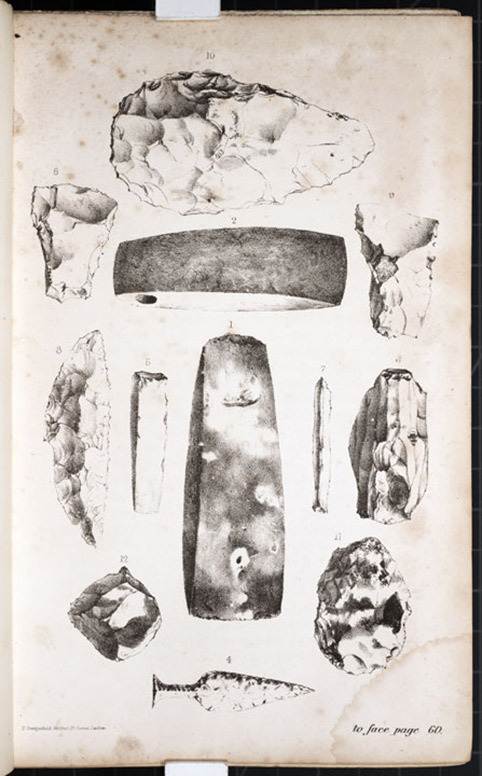 The plate shows Neolithic tools in the center, surrounded by a variety of Paleolithic specimens.